Although your air conditioner will last for years, almost 15 to 20 years to be exact, it will eventually reach the end of its life and require replacement. If you’ve chosen your home’s next air conditioning system, the next step is scheduling professional air conditioning installation to ensure you get the most from the new appliance you’ve selected. At Boerne Air Conditioning Experts, we can help—and we can also walk you through the entire process. Whether you’ve bought a central air system, mini-split ductless system, or heat pump system, air conditioning installation in Boerne is best left to a professional for speed, convenience, safety, and efficiency. When we install your AC system, it is a major process. We first dismantle and haul away your old system. Then, new ductwork is carefully added—allowing cold air to circulate throughout your house. The outdoor unit is mounted in a location where it can be reached for future repairs and maintenance. If the system is hooked up to a heat pump or other existing unit, this is completed. Finally, all the sections are connected, and new thermostats are added. This is a big job, and one that you should want to be completed by our trained experts. Prior to installation, you’ll obviously want to decide on a new unit. With all of the brands and different levels of systems available, how do you choose the right one? It’s important that you choose one that is large enough to cool your entire house as well as one durable enough to stand up to years of use in the Boerne, TX heat. When it comes to brand, a lot of that is personal preference. You can call and talk to one of our staff members at Boerne Air Conditioning Experts to learn more about the different brands we offer and perhaps decide which may work best for you. Our goal is to find a system that will satisfy you today and for years to come. Once you have decided on an air conditioning unit, the next step is to prepare for the installation day. First, learn if there are any inspections or permits required by your city, and schedule and acquire these as necessary. Before your new air conditioner can be installed, the old system must be removed, especially if you’re replacing it with a similar model. During this process, we’ll take care to protect the surrounding area and clean up any debris caused by removal. 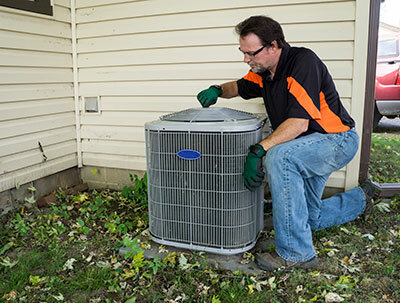 In most cases, our technicians will also handle the disposal of your old air conditioning unit. Following removal, your air conditioning we’ll also perform a complete evaluation of your home’s current cooling infrastructure to look for air duct leaks or other issues that could affect the performance of your new system. If repairs are needed, you will be notified before they are addressed. After your old system has been removed, installation of your new air conditioner will begin. 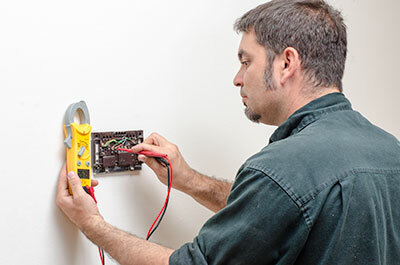 This process may require new piping or electrical and ductwork connections, depending on your old and new air conditioners and whether the hookups are the same. During this process, all electrical connections will be checked and refrigerant added to the system as per the manufacturer’s specifications. Your new air conditioner will be tested to ensure it works properly so you can begin using it as soon as your technician is finished with the job. It’s common that most new air conditioning systems come with a new thermostat. If you’d like the new thermostat installed, we can do so during the same visit. Alternatively, you may want to keep your existing thermostat, in which case we’ll simply make sure the connection between your thermostat and your new air conditioner is satisfactory. If you want to install a completely separate thermostat system, such as a smart or learning thermostat, our team can do so if you have your new thermostat on hand; if not, you can schedule a future service call for new thermostat installation. We’ll make sure you know how to use any new thermostat that is installed and leave you with the thermostat’s instructions before we leave. Finally, we’ll take your new air conditioning system through one final check. We’ll also go over any basic maintenance tasks you may be able to handle on your own, as well as how often these tasks should be completed. You can also opt to schedule your AC’s first maintenance service, or choose to do so at a later time. We’ll also let you know how often professional care is needed and we’re happy to provide you with the answers to any additional questions you may have before your installation is complete.